"Fantastic Spaces, Angelic Places," in Poe and Place, ed. Philip Phillips (Palgrave Macmillan, 2018), 169-92. This collection explores the theme of “place” in the life, works, and afterlife of Edgar A. Poe (1809-1849). Poe and Placeargues that “place” is an important critical category through which to understand this classic American author in new and interesting ways. The geographical “places” examined include the cities in which Poe lived and worked, specific locales included in his fictional works, imaginary places featured in his writings, physical and imaginary places and spaces from which he departed and those to which he sought to return, places he claimed to have gone, and places that have embraced him as their own. The geo-critical and geo-spatial perspectives in the collection offer fresh readings of Poe and provide readers new vantage points from which to approach Poe’s life, literary works, aesthetic concerns, and cultural afterlife. "Handling Memory in the Henriad: Forgetting Falstaff," eds. 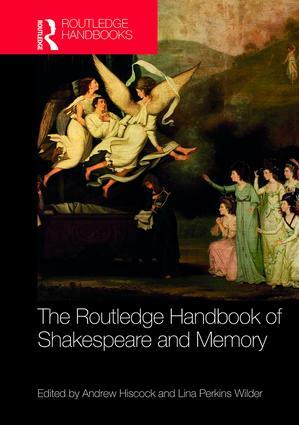 Andrew Hiscock and Lina Perkins Wilder, The Routledge Handbook of Shakespeare and Memory (London and New York: Routledge, 2017), 165-79. The book begins with a series of "Critical Introductions" offering an overview of memory in particular areas of Shakespeare such as theatre, print culture, visual arts, post-colonial adaptation and new media. These essays both introduce the topic but also explore specific areas such as the way in which Shakespeare’s representation in the visual arts created a national and then a global poet. "Poe's Resonance with Francis Quarles: Emblems, Melancholy, and the Art of Memory," in Deciphering Poe: Subtexts, Contexts, Subversive Meanings, ed. Alexandra Urakova (Bethlehem: Lehigh University Press/Rowman Littlefield, 2013), pp. 1-11. The essays in this collection offer a highly nuanced picture of Poe's engagement in the major discourses of the time, including his debt to baroque aesthetics, his tribute to the philosophical idea of sublimity, his complex response to racial issues, and his controversial afterlife reception--plus new readings of his texts explicitly using codes, secret writing or techniques of detection. "Kinetic emblems and memory images in The Winter's Tale, in Late Shakespeare, 1608“1613. Edited by Andrew J. Power and Rory Loughnane (Cambridge: Cambridge University Press, 2012), 71-87. Available now in paperback, "Engel uses the idea of the kinetic emblem in order to integrate stage architecture, dramaturgy, and Renaissance mnemonics and print culture in a dazzlingly comprehensive thematic and scenographic reading of The Winter's Tale. --Studies in English Literature 54:2 (2014), p.512. "Emblem Books and "John Florio, in The Encyclopedia of English Renaissance Literature. Eds. Garrett A. Sullivan Jr., Alan Stewart, et al. (London: Wiley-Blackwell, 2012). "The most comprehensive resource available for those working in English Renaissance literary studies, canonical authors and their works, as well as a variety of previously under-considered areas, including women writers, broadside ballads, commonplace books, and other popular literary forms; arranged in A-Z format across three fully indexed and cross-referenced volumes...cutting-edge critical discussion of literary works." "Shakespeare's Historical Context," in The Shakespeare Handbook. Eds. Andrew Hiscock and Stephen Longstaffe (London: Continuum Press, July 2009). A comprehensive, accessible and lucid coverage of the major issues and key figures in Shakespeare studies, designed to facilitate progression from introductory topics to more sophisitcated approaches.
" Death Slips onto the Renaissance Stage," in Acts and Texts: Performance and Ritual in the Middle Ages and the Renaissance. Eds. Laurie Postlewate and Wim HÃ¼sken (Amsterdam: Rodopi, 2007), 269-302. / Hardcover: 364 pages / ISBN-13: 978-9042021914. "For the Middle Ages and Renaissance, meaning and power were created and propagated through public performance. [...] Diverse in their objects of study, the essays in this volume all examine the links between the actual events of public performance and the textual origins and subsequent representation of those performances." "Reflecting on Performativity" in The Shakespeare Apocrypha (a publication of the Shakespeare Yearbook, XVIII). Eds. Douglas Brooks, John Ford, and Ann Thompson (Lewiston, Queenston, Lampeter: Edwin Mellen Press, 2007), 389-407. Entries on "Benjamin Banneker," "Marcus Garvey," "Mojo," and "Booker T. Washington," in The Greenwood Encyclopedia of African American Literature. Eds. Hans Ostrom and David J.Maceym (Greenwood Publishing, Sept. 2005) ISBN: 0313329729. "...the most comprehensive reference available on African American literature. While most of the entries are on individual authors, the encyclopedia gives special attention to the historical, cultural, and political contexts that have shaped African American writing. Included are entries on critical movements and terms, critics and scholars, historical and social issues, cultural and historical figures, literary forms and genres, literary schools and organizations, and many other topics." Entries on "Jack Ketch, public executioner" and "Roderigo Lopez, physician to Queen Elizabeth," in Great Lives from History: Notorious Lives, ed. Carl L. Bankston III (Pasadena, CA: Salem Press, 2007), II.565-66 and II.655-56. Over six hundred alphabetically arranged entries list basic biographical information, aliases, and notorious activities and briefly describe life history, careers both legitimate and notorious, any legal action that might have been brought, and impact. The indexes are very useful, especially the "Category Index," which groups names by 24 categories such as "Assassins," "Biblical Villains," "Dictators," and "Pirates." "Mnemonic Emblems and the Humanist Discourse of Knowledge," in Aspects of Renaissance and Baroque Symbol Theory, 1500-1700. Eds. Peter Daly and John Manning. New York: AMS Press, 1999. "..an extremely useful and well-thought out collection of essays on a variety of aspects of the emblematic culture in Europe during the early modern period.... The contributions are of the highest quality. This volume will be of interest not only to specialists but also those interested in cultural history, semiotics, and poetic theory." "Montaigne's Essais: The Literary and Literal Digesting of a Life," in The Rhetorics of Life-Writing in Early Modern Europe . Eds. Thomas Mayer and D. R. Woolf. Univ of Michigan Press, 1996. The volume is especially timely in light of the growing interest in "microhistory," and in the histories that are emerging from nonliterary documents. Chapters consider numerous genres, including hagiography, epistolary and verse biography, and less familiar forms such as parodic prosopography, life-writing in funeral sermons, and comic martyrology. "A fascinating survey of biographical genres...."